Using specialised rubbish removal services will not only help you get rid of your waste and clutter quickly but also in an eco-friendly manner. But before you call in the experts, you need to learn how to speak in their language. In other words, learning some popular waste collection and management lingo will be of great help to you when researching licensed junk removal businesses. That will enable you to know exactly what they mean when they say that they offer all-around garden clearance services in London, for example. Plus, expanding one’s vocabulary is something that can never hurt. Commercial – Collected from offices, restaurants, warehouses, shops, hotels and other commercial establishments. Materials can vary. Electronic – Also known as E-waste, it can include all sorts of electronic devices – from small music players or large flat-screen TVs to domestic appliances such as microwaves, for example. Food waste – Spoiled food, fruit and vegetable peels, meal scraps, etc. Hazardous – Materials that are dangerous for public health and the environment (paints, pesticides, solvents, chemicals, motor oils, thermometers and more. Garden – Grass, leaves, branches, old garden furniture. Garage – Old automotive batteries, tyres, waste oil, scrap metal – many of these materials are also classified as hazardous. Domestic – Collected from properties that have a residential character and typically includes items and rubbish generated as a direct result of the daily activities of the members of one household. Construction, demolition or after-builders waste – Cement, steel, plasterboards, concrete and any other unwanted or used construction materials or debris. Now that you know the correct definition of domestic or household waste, you are probably wondering if domestic waste collection services and house clearance is one and the same thing. No, they are not since house clearance services often involve the collection and disposal of a large amount of unwanted, broken or old items. Often times, these items are also very heavy and bulky. Contrary to popular belief, however, this type of professional junk hauling solution does suggest that the rubbish removal experts will come and collect all the contents of the property. This service can be used for full or partial projects. 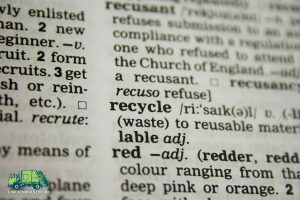 It is important that you know the difference between recyclable and reusable items. Recyclables are used products that can go through a special process and be used for the production of new products. Reusables are products or items that do not need to undergo such a process to be used again (e.g. reusable shopping bags). When rubbish collectors suggest you to take on composting they are saying that you should make a compost pile or bin in your garden and to use it to throw away certain food scraps (especially from fruits and vegetables), plant and garden debris, eggshells and more. In time, they will decompose on their own and turn into excellent fertilizer material which you can reuse later.